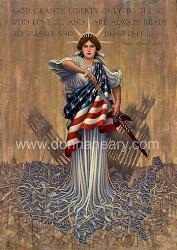 LIBERTY RISING A patriotic giclee by Donna J. Neary inspired by the events of Sept 11, 2001. Dedicated to all who serve. 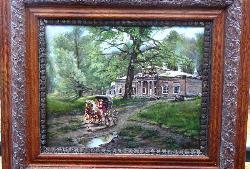 A striking giclee reproduction of the original painting by D. J. Neary capturing the very essence of the American Spirit. “GOD GRANTS LIBERTY ONLY TO THOSE WHO LOVE IT, AND ARE ALWAYS READY TO GUARD AND DEFEND IT” The above 1834 quotation by American statesman Daniel Webster is printed near the top of the image (giclee can also be ordered without this quotation). 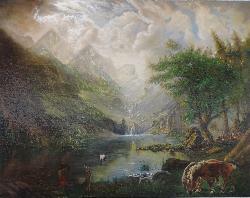 This inspiring image is available in two sizes on paper. The Liberty Edition is a signed numbered Limited Edition. The PATRIOT EDITION is a signed ‘open’’’’’’’’ edition. LIBERTY EDITION (28” X 20” image size) S/N Limited Edition of 2001 prints..